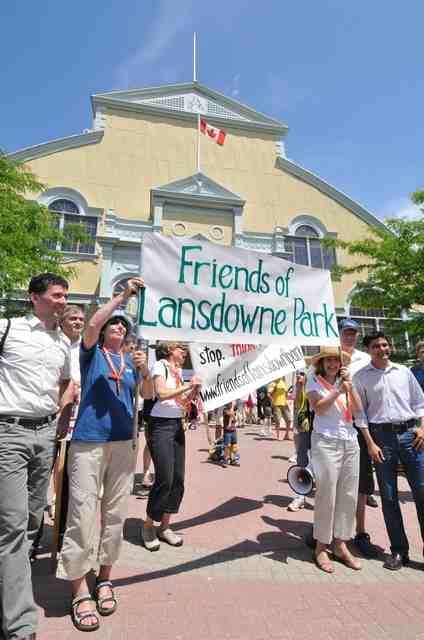 Friends of Lansdowne was formed in early 2009 in response to citizen concern about the city’s flawed process for planning the future of Lansdowne Park. It began as a coalition of people involved in a number of community associations in the core of the city, and has gradually spread out across to become a region-wide phenomenon. We launched our first campaign “Stop, Think, Get it Right” in June 2009 with a standing-room only public meeting at Lansdowne Park co-sponsored by 4 local community associations, the Ottawa Regional Society of Architects and the Ontario Association of Architects. Buoyed by that success, 500 people rallied a few weeks later to hear speeches by David Chernushenko, Gay Cook, Abby Hoffman and Sophie Crump and to march around the park with MP Paul Dewar and MPP Yasir Naqvi. In November 2009, we held a second rally at City Hall that was attended by an estimated 600 people. In June 2010, the Friends held another packed public meeting at Lansdowne Park where speakers included Gordon Henderson of the Kanata Beaverbrook Community Association, Bob McKinley of the Rural Council of Ottawa-Carleton, Shawn Menard of the Centretown Citizens Community Association, Ian Lee, Director, MBA Program, Sprott School of Business, Carleton University Professor and Paul Kariouk, Assistant Professor at the School of Architecture, Carleton University. In November 2010, the Friends hosted a legal talk and fundraiser, the “Lowdown on the Lansdowne Legal Challenge” at Old Ottawa South’s historic Mayfair Theatre. A second fundraiser, The Lansdowne Follies, filled the Mayfair again in February 2011. Letsgetitright.ca was launched on September 29th during the first week of public consultations on the Lansdowne Partnership Plan. The site was created to empower local residents to communicate quickly and effectively with Mayor O’Brien, City Council and the Media. We were concerned that the public consultation process may not be everything it was chalked up to be. We were unsure of how the data collected through the city’s e-consultation tool would be conveyed to Council. We felt that the best way for residents to be heard on this subject would be to provide a simple and easy way for them to reach the decision makers directly. We achieved this by automating the letter writing process and allowing residents to voice their opinion about Lansdowne Live with just one click of the mouse. Over the six weeks it operated in the Fall of 2009, Letsgetitright.ca provided 425 Ottawa residents the opportunity to freely express their opinions on this proposal. Of those 425, roughly 90% wrote to express their opposition to the Lansdowne Partnership Plan with a vast majority expressing their concern about sole sourcing and a lack of an open, transparent and fair procurement process. Read James O’Grady’s submission to City Council on behalf of Letsgetitright.ca (PDF). We would like to express our deep appreciation to everyone who participated in the Fall and we hope that you will continue to voice your opinion on this very important issue, this Spring.